The Deputy Minister of Youth and Sports, YB Steven Sim launched Fresh Breath For Malaysia, a youth empowerment and digital communication campaign by Guardian Malaysia and Limkokwing University of Creative Technology, here, today. A recent study of Malaysian dental students found that one in every two suffer from clinical oral malodour or bad breath. Worldwide figures indicate that from 22 percent to 50 percent of the global population suffer from moderate bad breath. Bad breath can have social and psychological effects on suffers including low self-confidence and low self-esteem, and it should be taken seriously. Guardian Malaysia, the largest health, beauty and personal care chain in Malaysia, with more than 400 stores nationwide held the campaign in conjunction with the introduction of its new Fresh Mouth 6 Actions mouthwash range. The campaign’s goal is to empower Limkokwing students to creatively interpret the theme of Fresh Breath for Malaysia as a showcase of positive energy towards the nation while encouraging better oral hygiene through visual expression and multimedia. A total of RM14,000 in cash prizes will be awarded to the top ten entries across two categories. According to the Deputy Minister of Youth and Sports, YB Steven Sim, the Fresh Breath for Malaysia campaign offers youth for Malaysia and around the globe the opportunity to be facilitators of change who can communicate from the heart and responsibly on an issue that afflicts many. “Today you take on oral care, tomorrow you take on even greater issues. A large part of the openness in Malaysia is driven by digital life as the reach and impact are profound. The challenge is to communicate responsibly and with kindness when tackling sensitive issues. The Fresh Breath for Malaysia campaign by Guardian and Limkokwing is a good platform to empower and to incentivise youth to have their say,” YB Steven Sim said. More than 100 entries were received from Limkokwing students, with 20 shortlisted entries sharing the rationale for their work before the Deputy Minister of Youth and Sports, the top management of Guardian and Limkokwing, industry partners and more than 500 of their peers. The Guardian Fresh Mouth 6 Actions Mouth Wash reduces dental plaque, prevents cavities, strengthens teeth, freshens breath, promotes healthier gums and restores mineral to enamel while killing 99.9% of germs. There are three variants of Cool Mint, Peppermint and Tea Leaf. When used as part of a complete oral care routine of twice daily brushing, flossing and with a good diet, mouthwashes may offer additional benefit in terms of reducing bad breath and cavities. Limkokwing University’sIndustry Empowerment Senior Vice President, Dato’ Raja Aznil Raja Hisham explained that the university and its students are uniquely suited to give a different perspective to the Fresh Breath for Malaysia campaign. “Our Cyberjaya campus hosts students from 160 countries. The multicultural milieu on campus gives rise to work that has a depth and breadth of creative global thinking and implementation that show through in the submissions we have received for the Fresh Breath for Malaysia campaign. The exposure that they have received and the industry experience they have received through this campaign is good preparation for their future careers. This 40-year track record gives the University an enormous advantage in providing valuable experiences to students. Limkokwing students work with some of the largest and most successful brands worldwide that market a wide range of products now including Guardian. This unique collaboration with industry has also been extended to build competitiveness and global reputation through innovative design and effective branding.” Dato’ Raja Aznil explained. Limkokwing University is a multicultural learning institution that provides students with industry exposure. Students gain industry insights and professional networking opportunities giving them the extra edge needed to succeed in a globalised environment. Online voting will begin on September 20, and the best digital communication campaign for Fresh Breath for Malaysia will be determined via the deliberation of an industry panel and online votes. 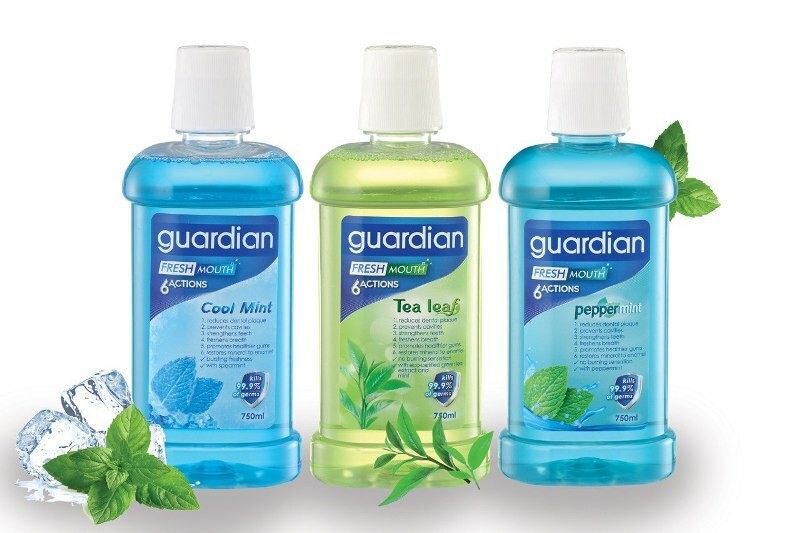 The Guardian Fresh Mouth 6 Actions Mouth Wash range is available at all Guardian outlets nationwide, and through the Guardian e-store at www.guardian.com.my in three variants of Cool Mint, Peppermint and Tea Leaf in 250ml at RM9.33, 750ml at RM16.88, or pack of 2 of 750ml at RM24.43. From a 200-sqft pharmaceutical retail outlet catering to the expatriate community to emerging as the leading Pharmacy, Health and Beauty retail chain in Malaysia, Guardian now operates a chain of over 400 stores, providing unrivalled variety of Pharmaceutical, Health and Beauty products to more than 2.5 million Malaysian customers a month, across the country. Guardian’s commitment to its customers’ needs is also reflected in a dedicated team of pharmacists, who impart professional advice and consultation to customers. Committed to strong corporate governance, which upholds responsible and ethical dispensing at all times. Guardian is also an advocate of corporate philanthropy and believes in giving back to the community. Guardian celebrates four decades of success by making a pledge to contribute to worthy causes by getting involved in the efforts that help to provide and promote the care, development and well-being of the local communities and supporting programs that are dedicated towards those in need namely, women and children. Dairy Farm is a leading pan-Asian retailer. At 30th June 2014, the Group and its associates and joint ventures operated over 5,800 outlets and employed over 100,000 people. It had total annual sales in 2013 exceeding US$12 billion. · Maxim’s in Hong Kong, mainland China and Vietnam. Dairy Farm International Holdings Limited is incorporated in Bermuda and has a standard listing on the London Stock Exchange as its primary listing, with secondary listings in Bermuda and Singapore. The Group’s businesses are managed from Hong Kong by Dairy Farm Management Services Limited through its regional offices. Dairy Farm is a member of the Jardine Matheson Group. Limkokwing University of Creative Technology is a private international university with a presence across Africa, Europe and Asia. With its main campus in Malaysia, the university has 14 other campuses in Botswana, Cambodia, China, Indonesia, Lesotho, Maldives, Sierra Leone, Sri Lanka, Swaziland and the United Kingdom. Founded in 1991 by Tan Sri Dato' Sri Paduka Dr Lim Kok Wing, the Limkokwing network of campuses now support a total enrolment of more than 30,000 students from more than 165 countries, making it the world's most globalized university.